How do family doctors choose their own family doctor? dividuals who are not in the medical profession. 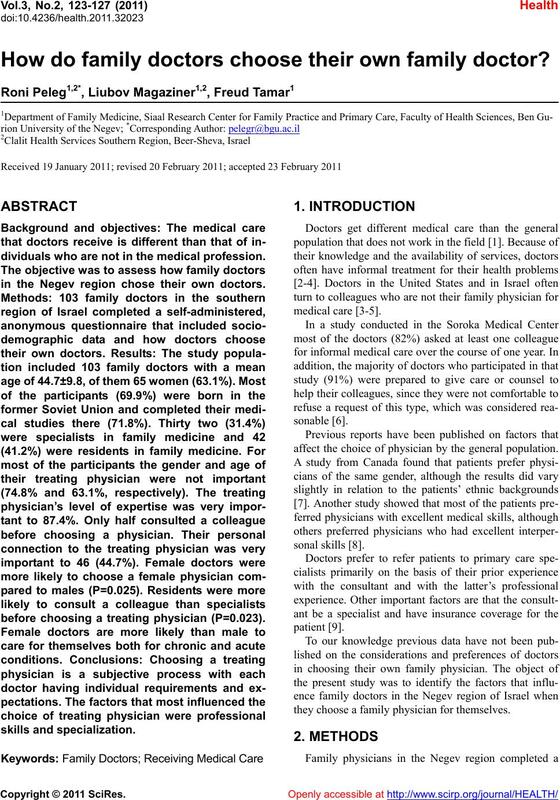 in the Negev region chose their own doctors. before choosing a treating physician (P=0.023). affect the choice of physician by the general population. they choose a family physician for them selves. level set at P < 0.05.
study participants are shown in [Table 1]. with the physician to be an important consideration. empathy as an important consideration. 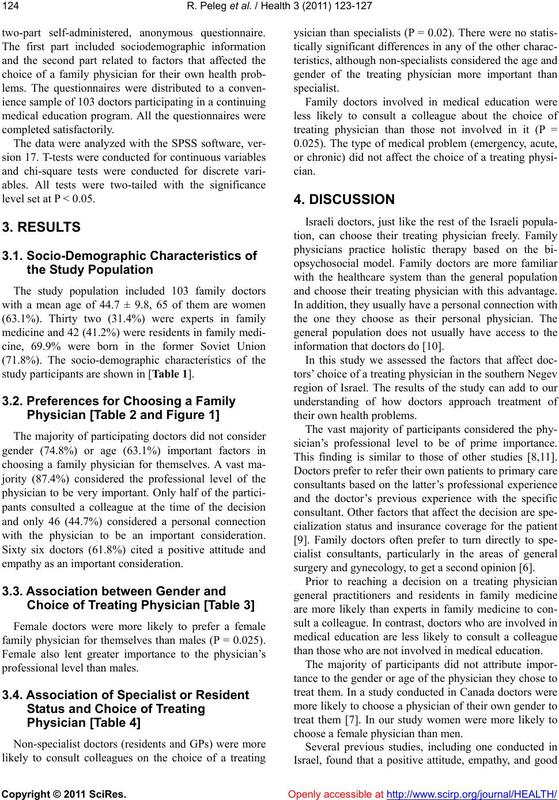 family physician for themselves than males (P = 0.025). and choose their treating physician with this advantage. information that doctors do . their own health pro bl e ms.
sician’s professional level to be of prime importance. This finding is similar to those of other studies [8,11]. surgery and gynecology, to get a second opinion . than those who are not involved in medical education. choose a female physician than men. Table 2. Preferences guiding choice of family physician. Did you consult with a colleague on the choice? How important is the clinic’s location to you? Did you switch your family physician over the last 3 years? Who do you turn to in an emergency? Who do you turn to for treatment of a chr onic disease? When was the last time you saw your family physician? Are your family members treated by your family physician? How is your relationship with your family physician? Figure 1. 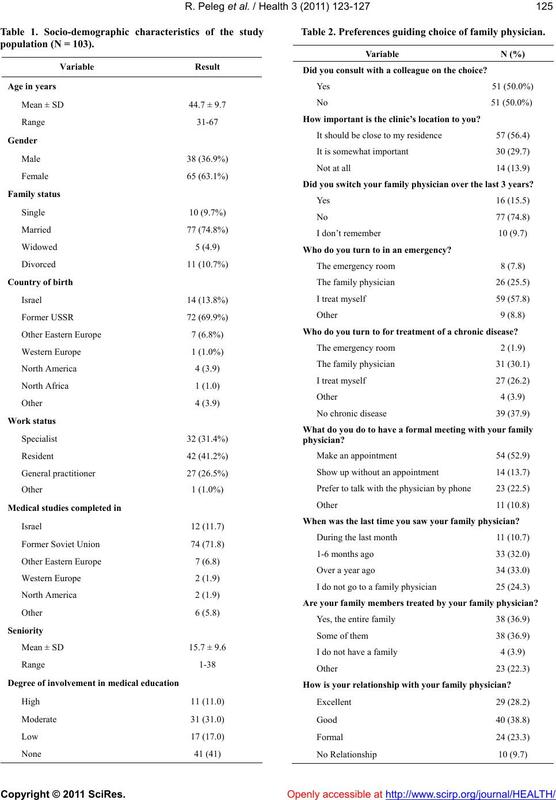 Preferences for choosing a family physician. Table 3. Comparison of attitudes by gender. Is your choice related to the physician’s gender? Is your choice related to the physician’s age? Is the physician’s professionalism important to you? Is the physician’s status important to you? Table 4. Comparison of attitudes by board certification. 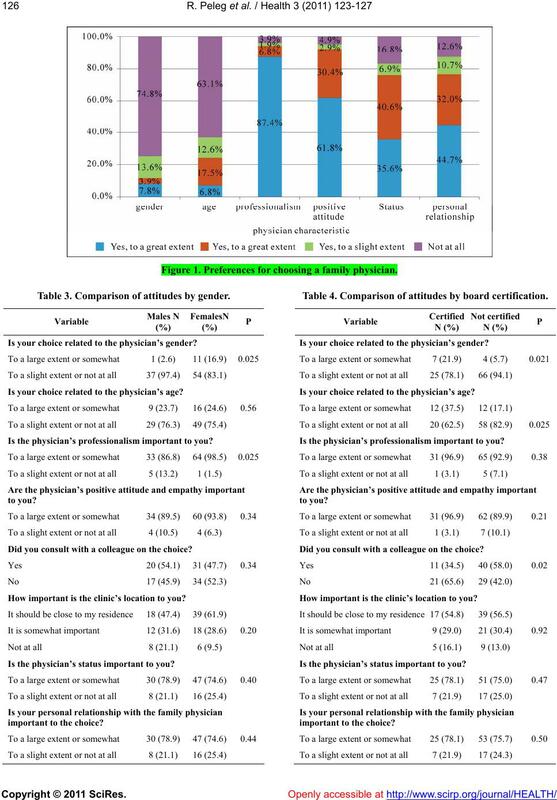 association with the treating ph ysician as v ery importan t.
The choice of a family physician is totally subjective. Everyone has his or her own demands and expectations. reached statistical significance due to small numbers. should be conducted with larger study populations. Levy, M.A., Arnold, R.M., Fine, M.J. and Kapoor, W.N. someone else try. Practitioner, 233, 891. Rennert, M., Hageel, L., Epstein, L. and Shifroni, G.
patient. Annals of Internal Medicine, 98, 654-659.
team? [Hebrew] Harefuah, 127, 527-529. Ahmad, F., Gupta, H., Rawlins, J. and Stewart, D.E. women. Family Practice, 19, 146-153.
cian. Health Services Research, 40, 957-977.
physicians. 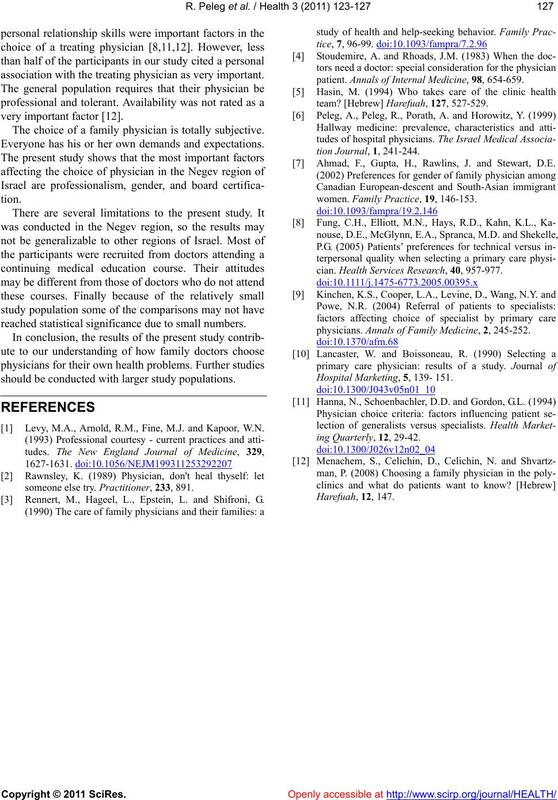 Annals of Family Medicine, 2, 245-252. Hospital Marketing, 5, 139- 151.